Figure 3. Characterization of pre-stasis HMEC grown in M85 with oxytocin. A. Expression of markers associated with proliferation (LI) and senescence (p16, SA-β-Gal) in pre-stasis 184D HMEC with increasing passage; stasis was at passage 15. Note the reciprocal relationship between the small cells with a positive LI, and the larger, often vacuolated cells (senescent morphology) that are positive for p16 and SA-β-Gal, and negative for LI. 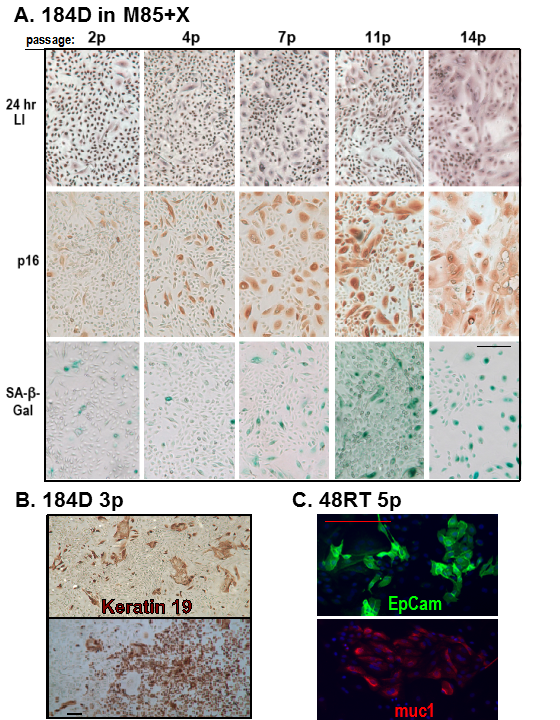 B. Immunohistochemistry expression of luminal lineage marker K19 in pre-stasis 184D HMEC. C. Immunofluorescence expression of luminal lineage markers EpCam and Muc1 in pre-stasis 48RT HMEC. Size marker = 200 microns.